Bias has been prevalent since the dawn of time, and as humans we fall prey to being biased in many facets of our lives (whether we realize it or not). Yet we are currently enduring an era where bias is permeating the tech industry, and something must be done. The gender gap is one of the most widely-recognized cases of bias in the technical industry, but it’s not the only one. Unconscious bias is one of the biggest catalysts to a lack of diversity in the technical industry. Although the largest impact can be seen within the hiring process, the effects trickle down throughout promotions and other areas. An unconscious preference for people who share similar qualities with you or someone you like. How you perceive your actions and those of others — our personal accomplishments are the result of hard work, but our failures are the result of external factors, whereas a candidate’s accomplishments are the result of luck and their failures result of a lack of ability. An unconscious preference for people who are physically attractive. When your views are swayed too much by those of other people. An unconscious search for evidence which support your opinions. An unconscious comparison of two or more similar candidates as opposed to examining each candidate individually. A preference for one gender over another gender. Focusing on one particularly positive feature of a candidate. Focusing on one particularly negative feature of a candidate. Unconscious bias directly impacts our ability to hire great candidates, so we must be diligent about recognizing and fighting it every single day. When we don’t address unconscious bias in the technical industry, severe problems begin to arise. Your company cannot employ a diverse workforce if unconscious bias is not addressed. When companies hire candidates who fit a one-size-fits-all mold, there is a lack of innovation. Innovation is drastically improved with a diverse workforce, because people from different backgrounds tend to view the world differently; they bring different vantage points to the drawing board. Additionally, employees from diverse backgrounds are more likely to empathize with users from all over the world, which can enhance the quality of the relationships you forge with your customers and may allow you to create solutions tailored to all. Facial recognition algorithms designed by IBM, Microsoft, and Face++ were found to have error rates approximately 35 percent higher when detecting the gender of darker-skinned women as opposed to lighter-skinned men. By removing unconscious bias we can employ a more diverse set of employees, which in turn may provide our algorithms with the tools needed to be inclusive of all people. Out of 557 female scientists interviewed by Harvard Business Review, two-thirds reported having to prove their skillset time and time again. And unfortunately, this constant need to prove their worth has driven many women out of the career. In a survey conducted by CNN Money, it was found that just 30% of professionals at Dell identify as female and that statistic dropped as low as 25% at Intel. Unconscious bias is leading to employees feeling insecure or personally attacked in the workplace. An effective company ensures the well-being of all employees, regardless of demographic or circumstance. There are five ways in which we can combat bias in the tech industry. Many technical interviews are geared towards one type of candidate; those who thrive under pressure to live-code and answer tricky technical questions. Developers who get nervous under pressure tend to fail at these types of interviews, but these can be some of the most brilliant candidates. By only leveraging high-stress, “on-the-spot” technical interviews, companies may exclude candidates who would be a true asset to their team. Thus, companies should leverage different interview styles, such as take-home challenges or pair programming, for candidates in order to ensure everyone has a fair chance to succeed. At LogMeIn I was given a take-home coding challenge. This task was achievable within a few hours, and was open-ended, ultimately allowing me to select my tech stack and architect the application as I saw fit. The take-home coding challenge is one great example of a different style of interviewing. It allowed me to showcase my skills in a low-stress situation, and ultimately get the job. Other technical interview styles could include pair programming. Through a pair programming activity, team members can see what it would be like to work with a candidate. This shows insights on a few different levels. It shows that the candidate is capable of educating fellow developers. It shows that the candidate stays up-to-date in the industry. It shows that the candidate has a passion for learning. Asking these types of questions give valuable insight into a candidate’s technical ability without putting them on-the-spot with a technical problem. The important note is to provide alternatives for candidates to showcase their best work. If you’re going to hire a diverse set of employees, it’s important to ensure they feel included in the company. LogMeIn is making great strides towards inclusiveness. LogHerIn is an initiative at LogMeIn which encourages women in technology. It’s a great way for women across the company to make connections and get support. There is even a Slack channel called Ladies Lunch which allow women to find a buddy for lunch, and not eat alone. LogMeIn also supports LGBTQ+ PRIDE, which stands for Promoting Respect, Inclusion, Diversity, and Equality. Interest and support groups allow employees of diverse backgrounds and demographics to connect on a personal level, ultimately delivering better work and enhancing employee happiness. My development team at LogMeIn created a social contract in order to establish more meaningful and trustworthy relationships. Social contracts are a great way to set the standard for acceptable communication and behavior. Additionally, it’s important to re-iterate important points that are said during meetings. If a team member makes a valuable observation, start your next point with “Sarah had a really great point, and to build on that…” This will build up your colleagues and validate their self-assuredness. All employees, regardless of demographic, deserve the same level of respect. This extends to compensation. The amount of money an employee makes should be based on merit, not on demographic; two employees in the same role, performing at the same level should make the same salary. When we base salary on gender or demographic, we limit the amount of greatness that employee can achieve. I’m not advocating that all employees in the same role should receive the same salary. Instead, employees performing at the same level for each role should be compensated equally. In order to eliminate unconscious bias, and employ a diverse workforce, we must start at the root of the issue; we must promote engineering as a viable career path for all beginning at a young age. Several conferences are making strides towards promoting engineering to the younger generations. 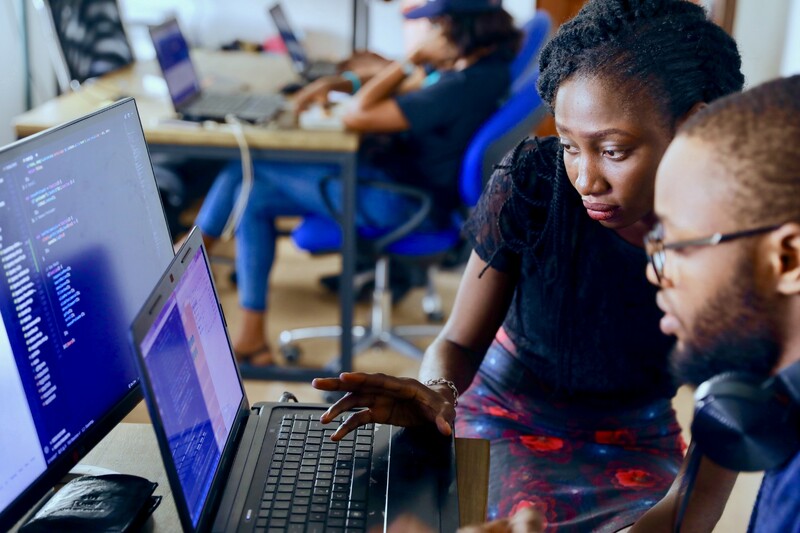 The Girls Who Code organization is pivotal to the younger generation of girls who are considering engineering as a career path. Their goal is to close the gender gap in technology, and have served over 9,000 girls to-date. By engaging the community, we plant the seed of programming as a legitimate and achievable career path to all children. We can change the stigma surrounding the tech industry with a little work and dedication. By recognizing our implicit biases we can combat a lack of diversification and improve the gap for women and under-represented minorities in science and technology.